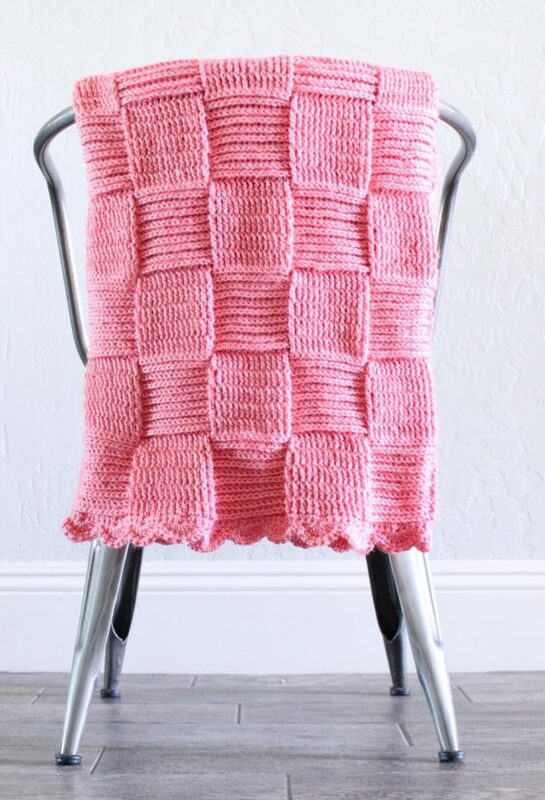 This pink gingham is the very first gingham blanket I made and a perfect place to start if you are learning how to crochet gingham. I used Caron Simply Soft yarn in the colors Strawberry and Light Pink. 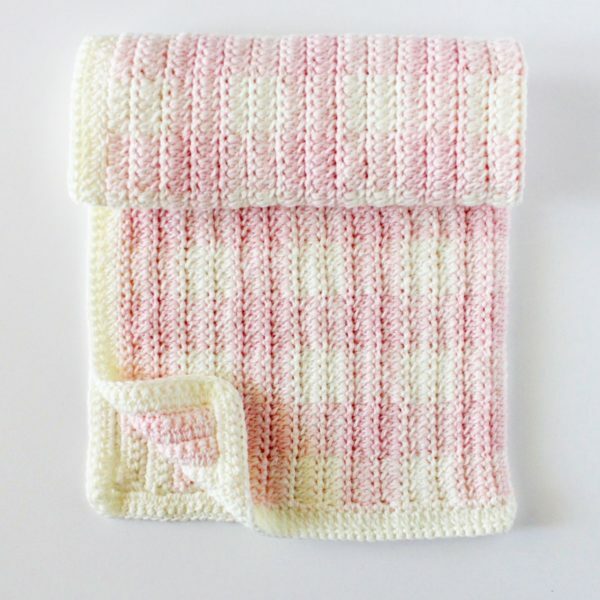 This is when I discovered that if you could find two similar shades of yarn and pair it with white, or cream, working the pattern so that the light pink is alternating with either the strawberry or white, it really does give off the appearance of gingham. 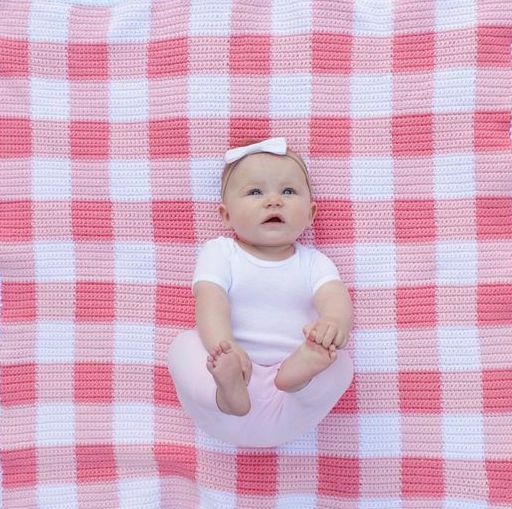 Be careful to alternate the colors just so, or your blanket will be a checkerboard pattern, not gingham. Click the picture or click here for the pattern! This blanket is my favorite out of all the gingham blankets I’ve made. The colors were just a shade or two different from each other and I love the cream color. I used Paton’s Beehive Baby Sport for this, in only two colors, but I combined two skeins, a pink and a cream, to make the third color. This blanket is perfectly snuggly without being too heavy. Click on the picture or click here for the pattern! To make a heart, you will have to grab some graph paper and sketch one out. On an 8.5 x 11 piece of graph paper, the largest square I could map out was 32 squares x 32 and I drew a heart in the middle. But If you don’t want to draw your own graph, you can also print one out! (see the bottom of the post) Click on the picture or click here for the pattern! 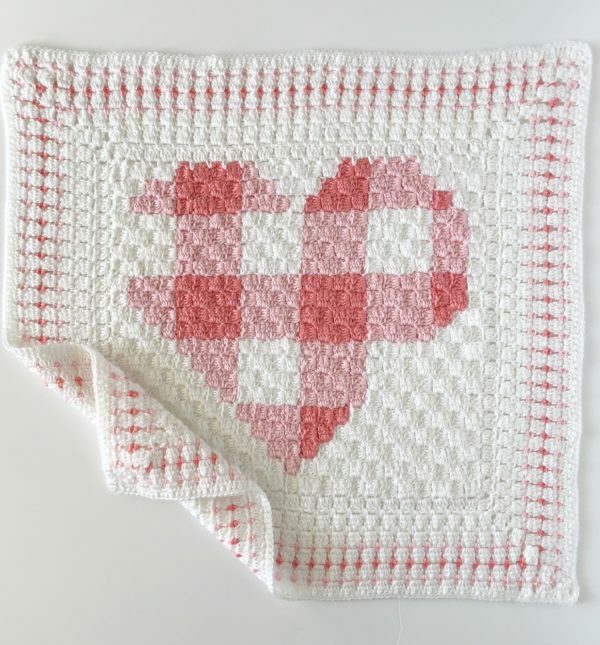 For this blanket, I used the corner to corner stitch to work the center portion of this crochet gingham heart blanket and then added 6 rounds of a block stitch for a giant border. I used Caron Simply Soft yarn for this blanket. Working the gingham with corner to corner can be a bit tricky, so you’ll want to be sure you’re familiar with regular corner to corner crochet before starting this blanket. Click on the picture or click here for the pattern! 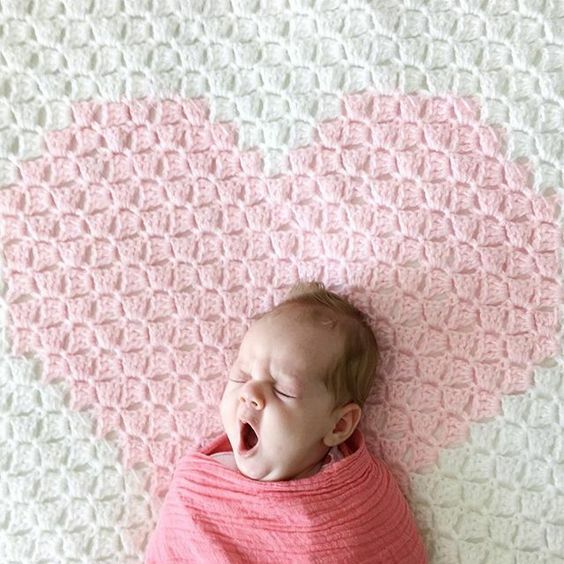 I loved making this giant basketweave blanket! It turned out so soft and squishy! I think it’s because of how the front post double crochet (FPDC) and the back post double crochet (BPDC) work. And also the yarn. I used Caron Simply Soft with a larger hook than I normally do and so the tension loosened up a bit and I’m suggesting you do the same. Click on the picture or click here for the pattern! The mesh stitch is a very easy stitch to do with fantastic results. I like that both sides of the blanket look the same. There is no right side or wrong side, except for the shell border, but that doesn’t matter at all. Click on the picture or click here for the pattern! Happy Valentine’s Day! I’d love to see whatever Valentine’s Day project you choose to make, so come find me on Instagram @daisyfarmcrafts and show me what you’ve made!